Brown rice tea, known as "genmaicha" in Japanese, is a special blend of green tea and roasted brown rice. Brown rice tea contains flavonoids, antioxidants, trace minerals and vitamins. The health benefits of brown rice tea are comparable to that of green tea. Brown rice tea has a nutty aroma and flavor, and you can serve it warm or use it to make iced tea. Brown rice tea contains antioxidants known as polyphenols, according to studies conducted by Case Western Reserve University in Cleveland, Ohio. Polyphenols in green tea may signal cancer cells to prohibit reproduction by stimulating a natural process of programmed cell death know as apoptosis. Studies conducted in China showed that men and women who consumed at least a cup of brown rice tea once a week for six months decreased their risks of colon, pancreatic and rectal cancer more than those who did not consume brown rice tea. According to the National Research Council, Japan has the lowest cancer rate, which is attributed to the large consumption of green tea--enhanced teas such as brown rice tea. Further studies are warranted to confirm the correlation between brown rice tea and cancer. You should not self-treat with brown rice tea in place of medical advice. If you suffer from heart disease or take anticoagulants, please consult with a medical physician before adding brown rice tea to your diet. Brown rice tea contains selenium, a vital mineral that helps maintain thyroid function and regulates hormones and metabolism. Brown rice tea is also abundant in manganese, an essential trace mineral that maintains healthy nerve functions, stabilizes blood sugar levels and aids the body in synthesizing cholesterol and essential fatty acids. 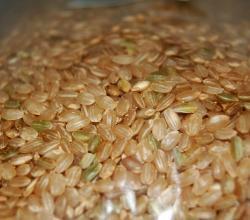 The health benefits of brown rice tea include vitamins B, fiber and iron.